When it comes down to showering it should be a time of relaxation, many see it as alone time, a time of reflection and it should be as comfortable as it possibly can be. People who live with disabilities may not have this privacy and relaxation when it comes to showering, due to the number of hazards presented in a wet, slippy bathroom, so alongside our guide on designing bathrooms for the visually impaired, we thought we’d let you know about our huge choice of shower seats that will help with bathroom independence. Properly installing an AKW shower seat lowers the likelihood of slips and falls by providing a comfortable position to shower in, sitting down. We believe shower seats should be sturdy, comfortable and secure. 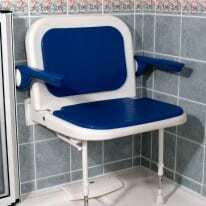 There are many different types of shower seats, for different needs. Our 2000 series of shower seats is a more than capable, practical range of furniture that will give support and comfort where it is used. This range can support a weight of up to 25 stone so it is sturdy and reliable, you can even buy extra cushion sets for the desired level of comfort. 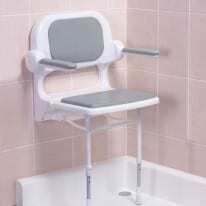 Our 4000 series contains many different model switch ups with different purposes in mind, such as a horseshoe seat or a flat, wide seat, but all models also contain a solid set of similar features such as adjustable position for comfort at different heights and a sturdily designed structure that can hold up to a weight of 40 stone. 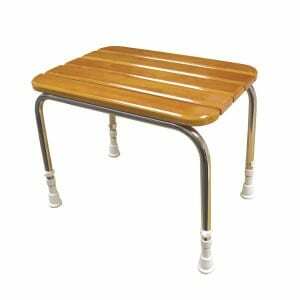 A more portable alternative to these is the freestanding stool range. This may be one to go for if you’re installing in a multi user bathroom or for a user that plans on going travelling a lot and needs that basic stability and comfort away from home. They’re easy to carry and just easy to use as our wall mounted seats. They are also adjustable in terms of height options. All of our shower seats are sturdy and reliable, but if you’re still not too sure which one would be best for you – don’t hesitate to contact us – or for more information view our entire range by clicking the button below.